In the early days of television, almost everything seen by viewers was in black and white. Up until the mid 1960’s, this was the case. Then, all of the sudden, that was a thing of the past as color overtook our world. Realistically, color was already there, but we were finally able to see it in our media. We live in a colorful world indeed! Today even the learning environments that we actively engage in are impacted by a beautiful spectrum of color. Color theory is something that isn’t new to designers, students, and faculty. In fact, it has been around for over 350 years thanks to one famous fellow named Sir Issac Newton. He started things off with the invention of a color wheel – a circular visualization of colors that includes the three primary colors red, blue, and yellow. 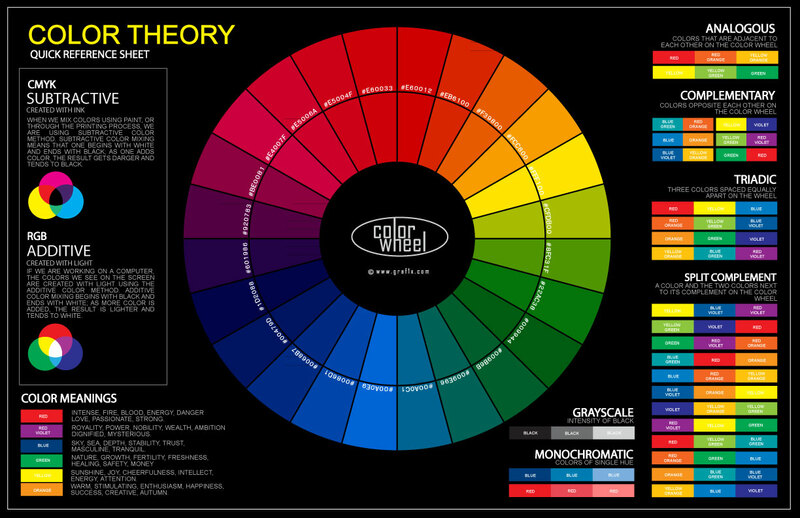 Since then, many variations of the wheel have been created, but the tried and true of primary colors as well as secondary and tertiary colors can be concluded as permanent anchors of this theory. Provided below are two (2) graphics that help illustrate the concept of color theory and a color wheel. 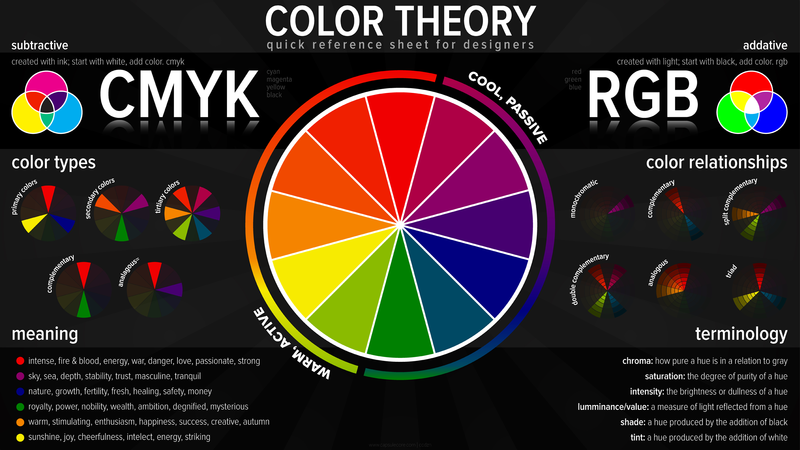 The first graphic is a general overview of color theory more in-depth whereas the second one is a quick reference sheet of a color wheel. Each graphic is available in a larger format by clicking on it (which opens in a new window). Always apply darker colors to lighter backgrounds and vice versa to ensure sufficient contrast and readability. Attempt to use colors for the appropriate meaning you are wanting to convey to others. For example, if you are wanting to promote warmth in some way, shades of orange are good to use. When developing documents (offline or online), it is always important to follow WCAG 2.0 AA standards (opens in a new window) to ensure it is Section 508/ADA compliant. If in doubt, test it out. Colors are easily changeable and may take a couple of tries to get the right combination for the situation or purpose. As the sun rises and sets each day we are alive, color is an important of a factor in our lives. Though most people don’t think much about color and color theory, they are critical to the way we live, love, learn, and share with others. Thus, it is with the hope that this colorful blog painted a brighter picture in your mind that you can share with others today, tomorrow, and beyond. Links provided below open up in a new window when clicked. We would love for you to join us for a training, which you can register for by going to our training calendar. If you would prefer to set up one on one training or group training on this subject or others available, contact the Distributed Education Team at 615-230-3665 or send us an email at eLearn@volstate.edu and we can get you all set up!